Choral music whether in a church or secular, can be quite lovely. The arrangement and swell of voices can raise the hairs on the back of your neck – after all, the voice is the first human instrument. Maybe the idea of signing in a choir interests you, and being able to use your voice. But how do you go about finding one? The first question is – can you sing in tune? It might seem stupid, but unless you can, there’s little point in seeking out a choir – they’ll reject you. You, and those around you, know if you can sing or not. For some choirs, though, simply singing in tune isn’t enough. You need good tone in your voice. Women tend to be either sopranos – the highest voices – or altos – a bit lower. Men are tenors, baritones, or basses, although the really deep voices are relatively rare. One thing few of us ever do is hear our own voice properly. Try recording yours, then play it back. You’ll get a shock, that much is guaranteed – none of us ever sounds quite the way we think, speaking or singing. But listen to yourself singing and compare it to others you’ve heard. There are many different types of choir. What most of us think of first is the church choir, and there’s no shortage of those, but they’re not for everyone. You’d need to enjoy singing hymns and a belief in the tenets of the church would be a great advantage. However, if the idea of signing in the church choir appeals to you, you should go to a Sunday morning service and talk to the vicar or minister afterwards, who will gladly pass your details to the choirmaster. You can also find a number of community choirs. Look in your local paper, which will give details of upcoming concerts (they’ll usually perform several times a year). Go and listen to them and the kind of music they’re singing. Can you imagine doing that yourself? If so, go and talk to the choirmaster afterwards. 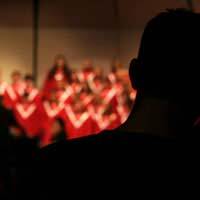 Like church choirs, community choirs are generally always looking for new members. Additionally, there are choral societies in parts of the country, and even light opera groups. Asking around and keeping an eye on the local press is a good way to discover them. You might also find specialised choirs, such as Socialist choirs. Again, these may not be your cup of tea, but if it sounds interesting, you’ll almost certainly see and hear them at political events (or other special events, depending on the type of choir). There are also more professional choirs. Again, they’re volunteers, but the standard is very high, and they’ll play prestigious venues and tour. These are definitely not for beginners. Every choir you apply to join is going to want to audition you, for fairly obvious reasons. They have to be sure you can sing. Don’t worry if you can’t read music; that can be taught later. Prepare your piece – it’ll either be of your choice or one given to you that’s common and familiar. Remember to work on your breathing and to sing from your diaphragm, not your throat, which will give a better tone and more control. If you’re accepted, you’ll find choir practices to be hard work, but great fun, because they’re social events as much as music training. You’ll learn to read music and enjoy the power of song from the other side. Your voice and technique will develop – probably quite quickly with proper instruction – and you may just end up wondering why you didn’t do this years ago.